Chemists and physicists from the Institute for Molecules and Materials at Radboud University Nijmegen can open and close nanocapsules with a magnet. They used the magnets of the HFML for their research. Thanks to this discovery the researchers can load the nanocapsules in a controlled manner. The mechanism opens up possibilities for the targeted transport and administration of medicines in the human body. The nanocapsules from Nijmegen look like miniscule indented balloons. The capsules are made from a polymer membrane. In a strong magnetic field of ten Tesla or higher the capsules change shape. As a result of this the capsules open up. Without the magnetic field they close again. The process is repeatable and can be remotely controlled. 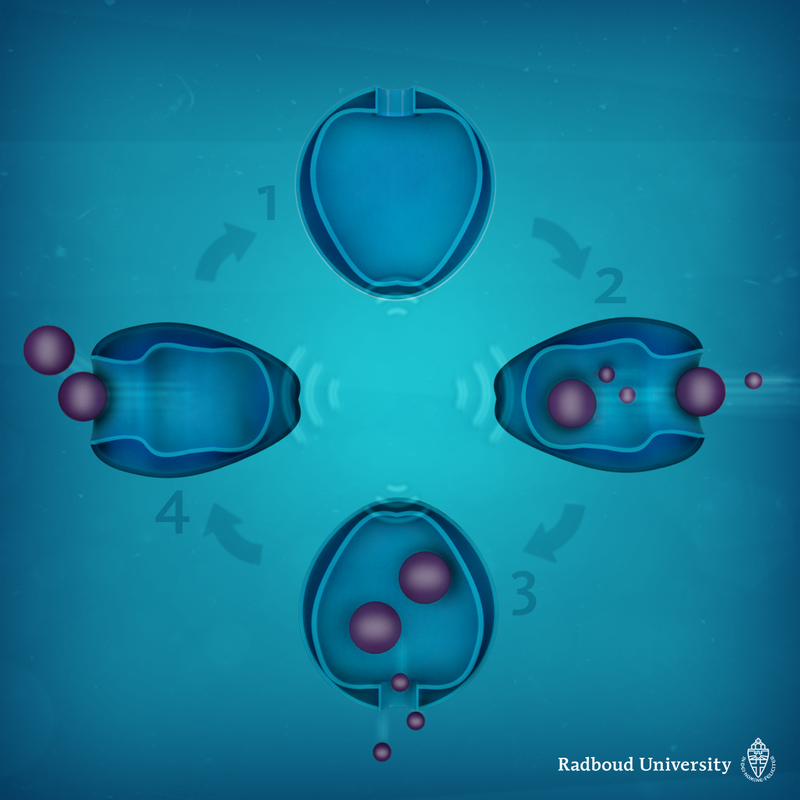 The scientists from Nijmegen have previously demonstrated that they could use the nanocapsules as tiny rockets. First they filled the capsules with a fuel. When the capsule discharged the combustion products it was propelled forwards. Follow-up research is now focusing on the combination of filling and propelling. The researchers want to fill a capsule with fuel and medicines. For the propulsion the opening must be so small that only the combustion products leave the capsule. Once it has reached the point of destination the opening must be made bigger so that the load can leave. The researchers want to investigate if they can open up the capsule more or less by varying the strength of the magnetic field. They also want to develop and test different types of wall molecules in their search for polymers that are suitable for use in the human body. Ideally these polymers would also work at a lower magnetic field strength, as then the technique would be suitable for use in MRI scanners in clinics. Polymersome magneto-valves for reversible capture and release of nanoparticles, P.G. van Rhee, R.S.M. Rikken, L.K.E.A. Abdelmohsen, J.C. Maan, R.J.M. Nolte, J.C.M. van Hest, P.C.M. Christianen and D.A. Wilson, Nature Communications 5, 5010 (2014). Schematic representation of the loading and release of the Nijmegen nanocapsules. 1. Without the magnetic field the capsule is closed. 2. With the field switched on it opens up and the load can enter it. 3. By making the magnetic field weaker the capsule partly closes and only the combustion products can be discharged. 4. With a strong magnetic field the capsule opens and the load is released. Credits: Radboud University/Marjolein van Diejen.